The Perth Mint has launched a $1 million gold coin featuring an extremely rare Red diamond sourced from the iconic Argyle Diamond Mine in Western Australia. 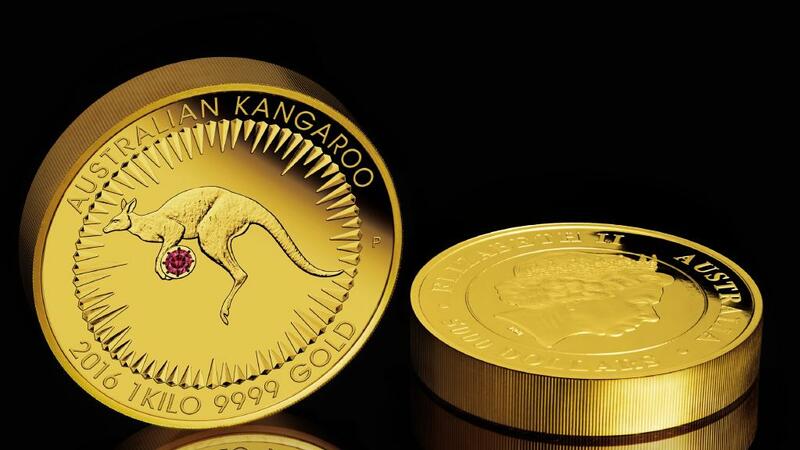 Known as the ‘Kimberley Treasure’, the magnificent coin features the image of a red kangaroo holding an incredible 0.54 carat, Radiant cut, Red diamond between its paws, and is made from 1 entire kilogram of 99.99 per cent pure gold. Perth Mint chief executive Richard Hayes said Argyle diamonds are so rare that an entire year’s worth of pink precious yield will fit into the palm of a person’s hand. This particular diamond exudes a hue so rich and deep, that it is classified as red, making it rarest of the rare. Premier Colin Barnett said at the launch, that the creation of this collectible is an example of the Perth Mint and Rio Tinto’s Argyle Diamond Mine sharing their passion for craftsmanship and Western Australia’s rare resources. Although the price makes the coin only accessible to a selected few, it is expected there might be hundreds of people from overseas interested in purchasing this treasure. Most likely, the Red diamond coin will be sold to someone who is fond of collecting unique and very rare things apart from having a very high net worth. Expectations are that it will be sold by the end of August 2016.